When I was a child, I remember that three flowers were never allowed in the house as they were traditionally linked to death. They were Lilies, Hyacinths and Lilac. Maybe this superstition was local to my family but has stuck in my mind since. 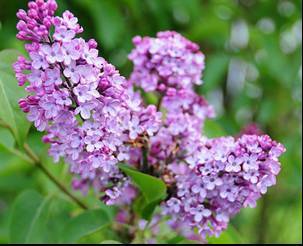 Syringa vulgaris the common lilac is a vigorous growing shrub which is useful for blocking an unsightly vista quickly. They need little maintenance and provide a wonderful show of attractive, highly scented spring blooms in whites, pinks, purples and of course lilacs. 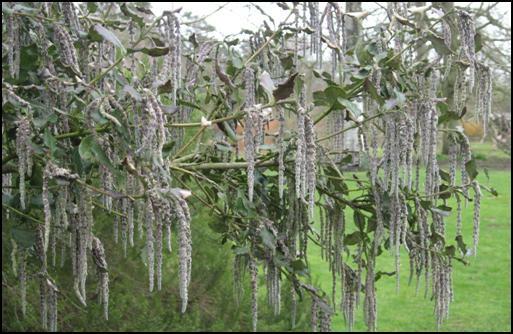 They are extremely hardy and although they prefer full sun, they will thrive in partial shade as well. The make good accent plants to build an attractive spring bed around. So there you are a good all rounder and despite the superstition a good source of cut flowers. There are not many grey flowering plants in the garden but this is one of the best. Early in the year it produces long grey catkins that give you a wonderful point of interest. Garryas can be grown as a multi-stemmed shrub or as a wall shrub. Due to its grey catkins and dullish dark green foliage, it looks good against a red brick wall. A good combination is Garrya elliptica ‘James Roof’ (this variety has the longest catkins) planted along side Clematis armandii, the early flowering clematis. The combination is subtle and again against a red brick wall is very beautiful. Possibly because they are used a lot by municipal gardeners or the fact they become leggy and unattractive if not annually tended, this winter flowering shrub has been given the thumbs down over the last few years. They are however a great plant to bring sunshine into a dull winter garden with their vibrant yellow plumes of flowers. Not only are they colourful, they have several other attributes. They have sharp holly like leaves that can be a deterrent to unwelcome visitors to the garden. 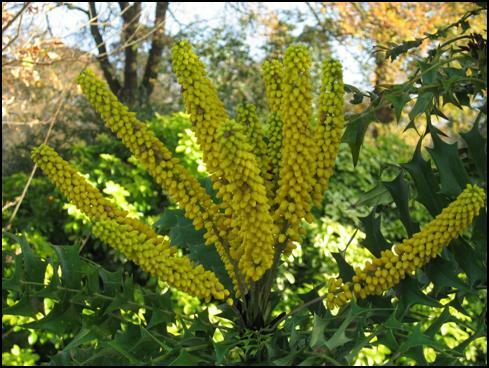 Some varieties such as Mahonia wagnerei are strongly scented. They are evergreen with attractive glossy leaves that turn red and bronze in autumn. So all in all a very unworthy plant to be on an unfashionable list. Just love it and tend to it annually and it will repay you with a useful and beautiful contribution to your garden. 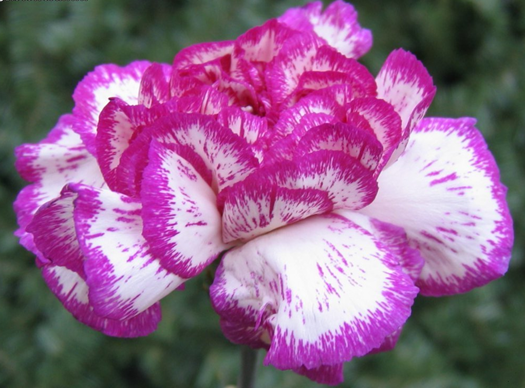 OK, Carnations (Dianthus) have been bred into Frankenstein’s flowers with extreme colour combinations and shapes. When the breeder guys had finished with them, the floristry people sprayed them royal blue and bright green! Rising above such outrages, these are beautiful and useful plants for both the garden and in the house. I remember when I was younger, I moved to live in Lanarkshire in Scotland. I visited the local village flower and veg. show in a village called Glassford (pronounced Glessert). I expected the usual amateur enthusiasts produce. So on entering the church hall I was stopped in my tracks by the Chelsea quality flowers – Chrysanthemums and Carnations. These were stunning, not only in quality but also in variety. A lot of these had been bred by the local growers and were just amazing. I forget the two families’ names but apparently their competitiveness had gone back several generations and wao, the blooms were perfection. The Diathus group comes from the Mediterranean region but in spite of that, they can be marginally or full-frost hardy and produce a show of highly scented flowers in summer. They work particularly well as a back drop to geraniums such as ‘Johnson’s Blue’ or ‘Orion’. One of the very first plants that I was given to grow by my Dad was Calendula officinalis or the common marigold. So how come this is now so unfashionable. They not only bring vibrancy to the garden but also bring a great deal of insects. They are edible, bringing an attractive zing to the most humble salad, they have medicinal qualities and they are most useful if planted amongst your more susceptible plants such as tomatoes as they draw the bugs away from them. 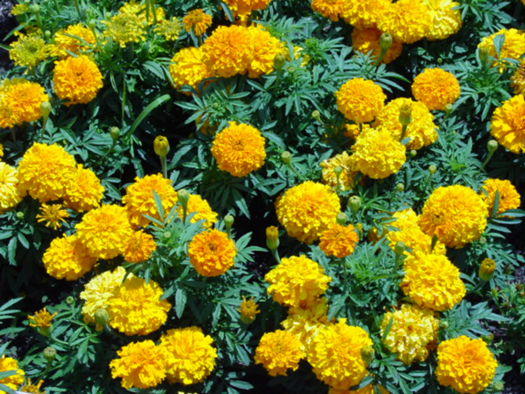 So, let’s hear it for the humble marigold and give it a rightful place in your garden.